2D CAD system for your design. The difference is that, with Revit MEP, you will be able to use the data within your design to help make decisions and to coordinate with other disciplines and project systems. Ask your consultant for a flat CAD file that you can use throughout the project; in other words, a file that the consultant will update as changes are made to the project site. The civil engineering and architectural consultants on your project may be sharing files also. At a minimum, the architect would share the building model so that the civil consultant could properly locate the building on the site. 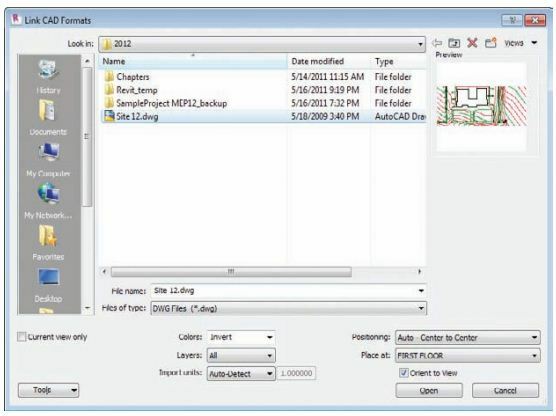 Your architect may choose to use the 3D data from the site file to generate a site plan within Revit. If so, you can use this information to create your site lighting layout. Although the architectural site model would give you topographical information, it also is only as up-to-date and accurate as the architect keeps it. 1. Create a view associated with the ground level of your project. Because this is a site plan, the view does not have to contain only lighting system elements, so categorize your viewin a manner that makes the most sense for your Project Browser organization. It may be best to create a subdiscipline under Electrical called Site to keep all your site-related views properly organized. 2. Set the View Range settings to display the building model properly; that is, as it would appear in a site plan. 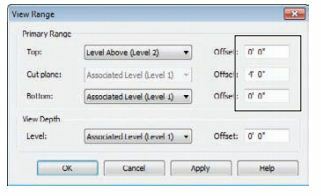 You can set the Top setting of your view and the Cut Plane setting to an elevation higher than the building so that it displays as seen from high above. building outline instead of getting that information from the architectural model. 3. Link the CAD file from your consultant into this view. Consider the option for linking the file into this view only if it is the only place that the site CAD file needs to appear. You could also create a workset for the linked site file so that you can easily control whether it is loaded when your file is opened. Whatever you decide, link the file; do not import it. An imported site file will wreak havoc on your model, and you will not be able to update the file automatically when it changes.